The new rrmetro.org “mega-menu” feature offers an expanded view of sub-pages for easier navigation. 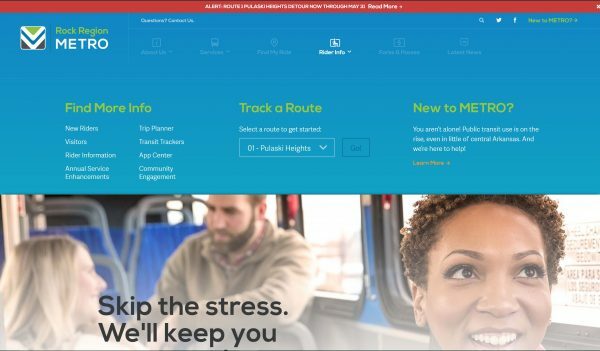 A little more than a year after its initial launch, Rock Region METRO’s website received some visitor-friendly updates Wednesday. Changes include the integration of a “mega-menu” feature making sub-pages more prominent, as well as a more robust sidebar navigation menu on interior pages. The mega-menu features a more prominent “seasonal messaging” call-out at the top of major content areas that allows for rotating messaging for specific campaigns, such as the upcoming annual Ditch the Keys: Ride Transit for Free Day. Although the website has had responsive design for a variety of devices since its launch in January 2016, the mobile site navigation has been modified to give improved visibility to subpages. The mobile site menu features a call-out link for all major content areas and new icons appearing at the bottom of interior pages to promote related subpages. With roughly 70 percent of visitors accessing rrmetro.org through mobile devices, these mobile site navigation changes were a key aspect of the project. The site also joins the existing trip planner tool and bus and streetcar live maps, bringing routing and tracking information together in one place, with related schedule tables, map and route brochure PDFs, and stop tables jointly displayed. The site also features an “interactive Frequently Asked Questions” feature designed to get visitors needed information as quickly as possible by allowing a quick drill-down of various content areas. Finally, an improved plan for site analytics means more specific data will inform future site updates. “We were excited to launch our new website last year and have been very pleased with its performance. After working within its framework for a year, the structure has held up nicely, but it was time to make a few tweaks based on the user experience. We’re even more pleased with the latest version of rrmetro.org and hope our site visitors find the new features intuitive and functional,” said Becca Green, METRO director of public engagement.